Karen and I spent 10 days touring the Galapagos Islands with a tour from INCA. It was wonderful! This is the story. Each of the pictures is linked to a larger, screen size version. Click on the picture to see the larger version. Use the "Back" button to return to the page. 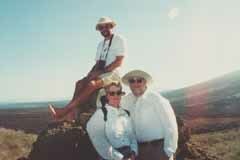 This is us on top of an inactive volcano 500 feet above sea level on Isabella, the largest island in the Galapagos. Behind us, on the top of the rock, is Richard Polatty, our naturalist/guide, who gave us wonderful insight into the islands and their inhabitants. He also kept up a fast pace, which insured we did not gain weight, in spite of the best efforts of the ship's cook! We saw so much and took so many pictures, that organizing these web pages is going to be difficult. To make it easier, we'll simply do it by our itinerary, recreating our trip for you. 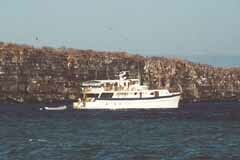 The Galapagos Islands are a small group of volcanic islands 600 miles west of Ecuador, which owns them. They are a national park, protected environmentally, with restricted visitation. 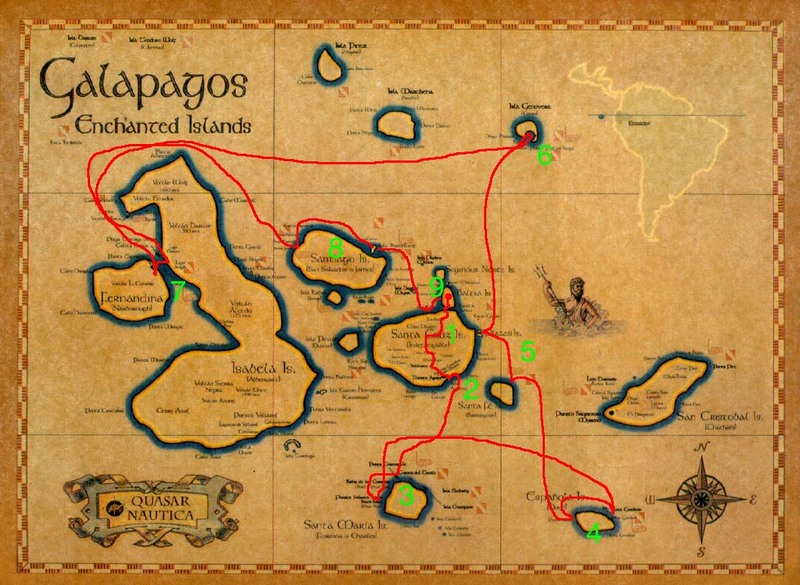 In order to go to the Galapagos, you must have a guide and go through Ecuador. 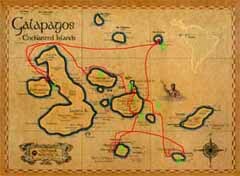 About 87,000 visitors go each year, so typically fewer than 2,000 are in the islands at any time. You rarely see other groups as you visit each island! The area is not large - the map here covers about 200 miles wide by 125 miles high and the equator runs across about 1/3 the way down from the top. There were nine of us in the INCA group. 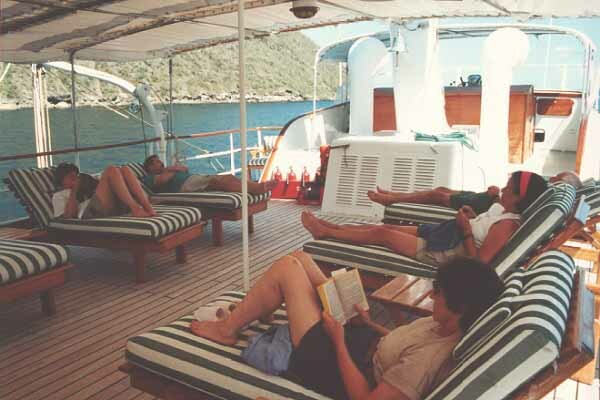 We stayed most of the time on the Parranda,* once a Texas oilman's yacht. 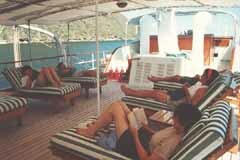 It was luxurious, air-conditioned and had a handsome young captain and a friendly crew, including a great chef! *Parranda means "wild party" in Spanish, we're told. 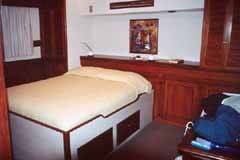 We had the master cabin, a large cabin with a double bed, lots of beautiful wood and views out both sides of the boat. Being far away from the engines, it was quiet, except when they raised or dropped the anchor, which was right next to us! We spent a lot of time on the top deck. The weather was mild, the breeze dry and cooling, and the view-SPECTACULAR! Great place to snooze during siesta time too. Click on each day for that's day's story. Friday, June 1, Fly to Quito via Miami, Luggage soaked during downpour at Miami! Saturday, June 2, Fly to Baltra, Galapagos Is., via Guyaquil (on a verry old Boeing 727-200, but these are still workhorse airplanes.). Land on a runway built by US forces during WWII to defend the Pacific. Tour Santa Cruz highlands, see giant lava sinkholes, lava tubes, a rare sighting of a brown owl and many giant tortoises. Lunch at a nice rustic restaurant, The Narwahl. Spent night at Hotel Galapagos, dry soaked clothing on lines. Walked around Puerto Ayora with locals celebrating beating Peru in Soccer for World Cup Finals. Nice dinner at hotel. AM: Visited Charles Darwin Research Center to see "Lonesome George" and other giant tortoises where theyre being bred. PM: Took "panga" ride to see birds along harbor at Puerto Ayora. Boarded Parranda in the evening, headed to first stop. Met Richard Polatty, our naturalist for the rest of the trip. Late at "Post Office" to drop off letters. AM: Isabela , Caleta Tagus, Darwin Lake, climbing a 500 foot crater.